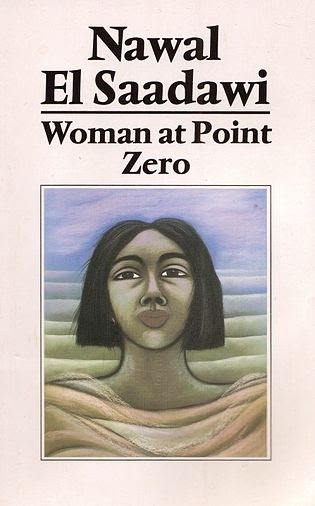 A novel titled Woman at Point Zero was written by Nawal el-Saadawi, an ex-Editor in Chief of Health Magazine in Egypt and also a psychiatrist. The novel, which belongs to Arabic literature, was published in 1975. The novel tells the readers about the true experience of Nawal when she did a research about female prisoner. For an additional information, this is one of Nawal’s book themed feminist. The first chapter of the novel tells about how Nawal struggles to meet a female prisoner named Firdaus, the main character of the novel. She is a prisoner who is sentenced to death for killing a man named Marzouk. Unlike other prisoners, Firdaus never accepts visitors who want to see her, never talks to anyone, and even does not eat and sleep. Nawal tries to meet Firdaus, but she was rejected for many times and thus it makes her to be very weak and helpless. Fortunately, one day, when Nawal wants to go home after being rejected by Firdaus again, Nawal is told by wardress that Firdaus wants to meet her. After being allowed to meet Firdaus, Nawal follow the wardress to go to the cell of Firdaus. When they arrive, Firdaus told Nawal to close the window and then sit on the ground. Entering chapter 2, the readers can read the sadness life of Firdaus that directly tells by Firdaus, as the switched narrator, without any interruption from Nawal as she wants to before telling the story of her life. In this chapter, Firdaus clearly tells the reader about her life as a prostitute and the reason why she killed a man named Marzouk, who is her pimp. She explains that she does not mean to be a prostitute, but men in her life make her grows a prostitute. Chapter 2 is the longest chapter of this novel. In this chapter, Firdaus tells how her tragic childhood was until how she can be in the prison and gets sentence to death. It seems to her that the sentence given to her is not because she murdered Marzouk. She highly convinces that it’s because she talks about how rude all men are and “they”, who are the government officials, belong to. Firdaus thinks, “they” feel Firdaus is harmful for them: if she lives, it means death for “them”; if she died, it means a life for “them”. Thus, they want Firdaus to be sentenced to death soon. Finally, in the last chapter, which is chapter 3, Nawal tells that after telling her story, Firdaus was taken by the police to be executed. Nawal then goes to her car and feels ashamed with herself. She thinks that Firdaus is a tough and brave woman, even tougher and braver than herself. She does introspection in this chapter. For me, this novel is very good since it was written based on a true story. By reading this novel, I can open my mind wider that oppression towards woman can even happened in the family. At last, tragically, I can know that arbitrary actions towards woman can also did by the government officials!